You have come to the right place to find help with your missing pet. We have one focus in mind – helping the animals. 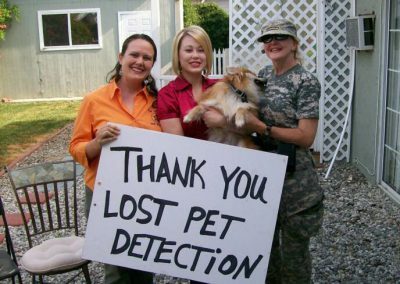 Through our extensive experience, we have helped many people in the recovery of their missing pets. 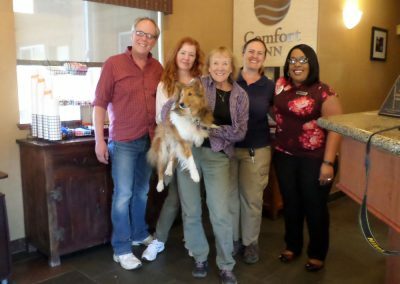 Whether you’re looking for in-person Search Dog help, phone or email consultations or tips and tricks to find your lost pet, we can help! “It was eleven days of pain. Gus went missing the afternoon of February 12th. After searching, posting posters, flyers and driving all over, we called Annalisa. She came over on February 22nd, with Search Dogs June and Hope. As she tracked Gus’s scent trail, she kept us posted with GPS maps that reflected his exact route he took over the last 10 days. It rained almost everyday he was gone and even hailed one day (in Southern California no less). 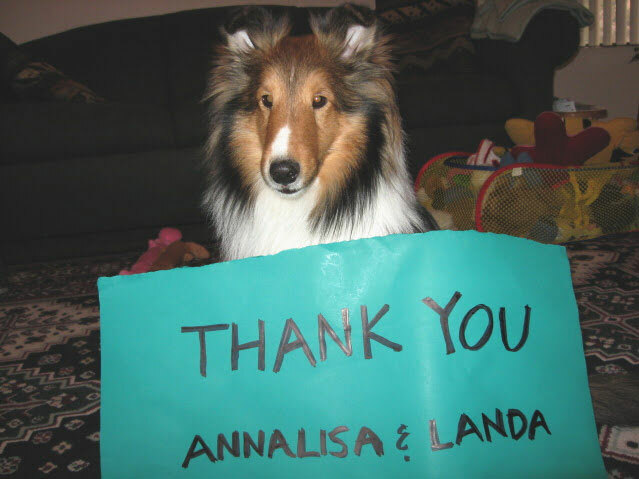 When finished, Annalisa and her dogs reduced the whole city of Escondido, down to 2 streets. She said it was very probable, that Gus was hunkered down in this area. The next morning we set up signs and posters in the area. About 10 minutes pass and a woman stops and says Gus maybe in her yard. Boom baby, she was correct. I used a squeak toy, called his name and then Gus caught our scent and walked right over to us. He was just as excited as we were. He had a few bruises, lost a few pounds, but was in pretty good shape. “When we lost our dog Wolfie, we were afraid we’d never see him again. He was wearing a collar and tags, but he is shy, and we had almost no hope he’d approach people who were unfamiliar to him. We received a few false leads which wasted days of our time searching in the wrong areas. “I’ve been unable to sleep since the day Napoleon went missing. As a Mom our duties never ends. It’s hard to grieve when you have a million things going on. even with tears in my eyes I kept my day going. Camps, tutoring, volleyball, house renovation, meetings, etc. Unable to truly focus on my tasks… I’m thankful for my husband doing his best at consoling me. Somehow even then, I STILL felt inconsolable. I was so overwhelmed for the entire 4 days before I contacted Pet Search and Rescue. I had bags under my eyes with the lack of sleep from being up all night on a look out or the false sounds of barks I thought I heard that had me popping up every hour. When you and your team came out and helped me that night was the first night I was able to sleep through the night. Carol & Pan & Gopher & Kimi & Senna, FOUND with Search Dogs and Consultation! Tiffany & Roey, FOUND with Consultation! 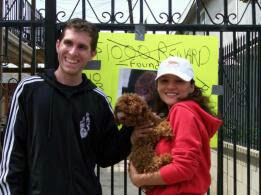 Rick and Amy, FOUND with Search Dogs and Consultation! Dawn, FOUND with Search Dogs and Consultation! Marta and Robert, FOUND with Coaching! London – FOUND with Coaching! 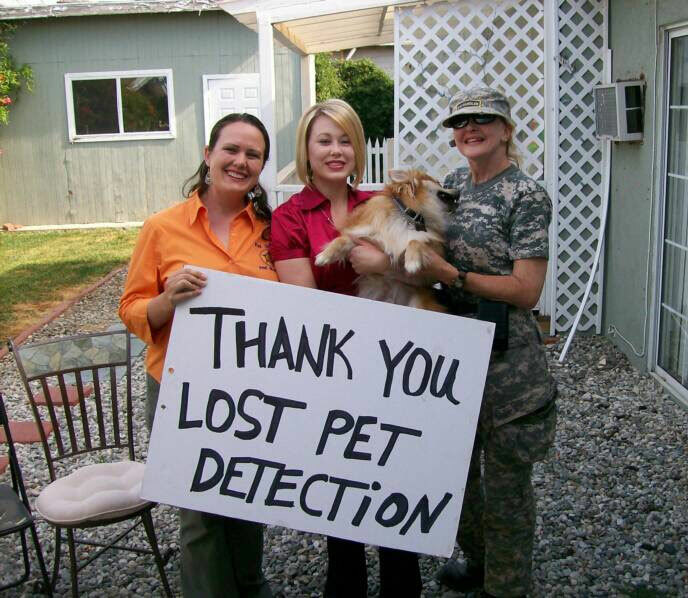 Share Your Story with Pet Search and Rescue. Submissions may be shared on this site.